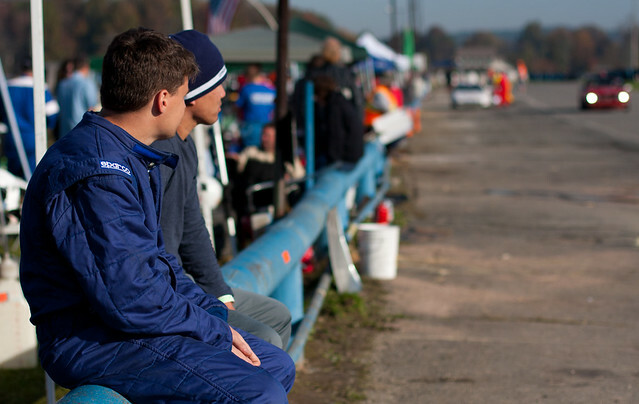 In the world of endurance racing, any race that you finish is a good one. Making it through the whole race without stopping save for driver changes & fueling makes it great. Beating your place expectations? That really makes things awesome. This past weekend at the Longer Longest Day we had an awesome race. This was our second Chump Car event and also our second full-day event. The Longer Longest Day is a play on 25 hour races, created to trump 24 hour affairs. 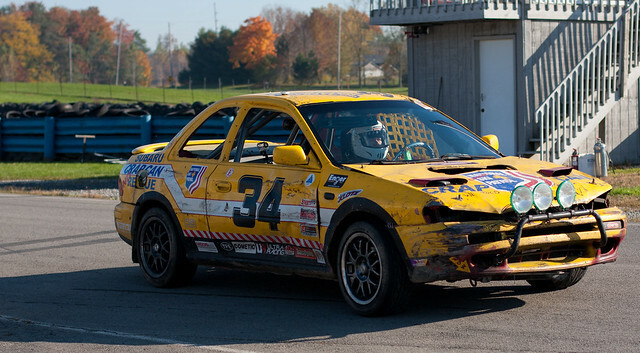 Crap can racers are certainly known for making things difficult on themselves, so the 25 hour, 25 minute, 25 second format is ostensibly the hardest track race out there, at least as far as time is concerned. 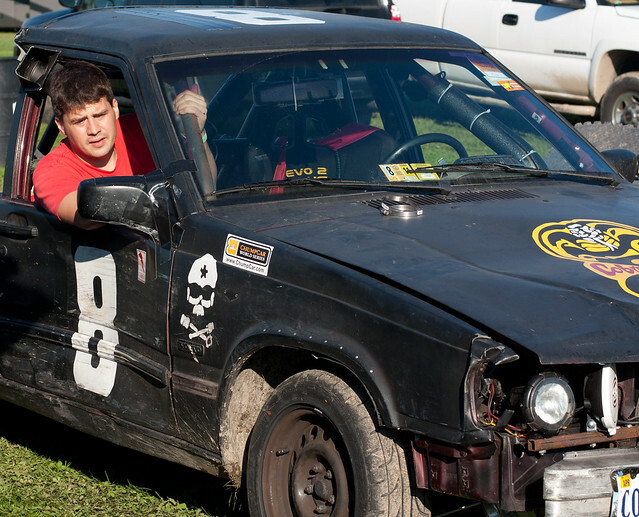 Our car prep began only a few weeks before the event—after you’ve done a few races it’s pretty easy to get cavalier about it all. Aside from a new set of tires (the awesomely named Dunlop Direzza Sport Z1 Star Spec) and moving the battery, we had to fix the steering. Our last race, the Chump Car 24 Hours of VIR, ended when we got T-boned in the last 3 hours, resulting in a broken steering ball joint. The replacement part was slightly too long, giving the car excessive toe-out, which we fixed by grinding it to length. The biggest change we made to the car was improving the lighting—our first 24 hour experience was completed on a single set of 35 watt Optilux 4″ HID driving lights. We had a pair of 55 watt halogen Hella 500FFs in a fog pattern setup as apex lights, but they failed in the first night stint; their output was so dim relative to the HIDs that we didn’t bother diagnosing them. Replacing the halogens in the 500FFs with HID lamps made a world of difference. Night stints are no longer a stumbling affair of surprising corners, drivers can now confidently charge around track without fear of surprises hidden in the darkness. Nelson Ledges Road Course is outside of Garrettsville, Ohio and not far from Youngstown. The track is about 6 hours from Cobra Kai’s home base of Arlington, Virginia. This race brought in a couple of drivers from Miami who flew into DC on Thursday and one from Pittsburgh. We convoyed to the track stopping at Costco & Walmart on the way to obtain various supplies. Arriving late on Thursday was less than ideal—not knowing the track we couldn’t tell what an advantageous paddock spot would be. Luckily the majority of teams had arrived much earlier in the day, making our decision fairly easy. The weather was quite good, high 50°F at night and mid 70°F during the day, aside from copious nighttime dew each night which led to very soft ground in the paddock and around the track that persisted through the weekend. Friday’s test session was an reasonable deal as far as these things go: $200 for 4 drivers from 9 to 5 with occasional interruption for racetrack-crossing traffic. 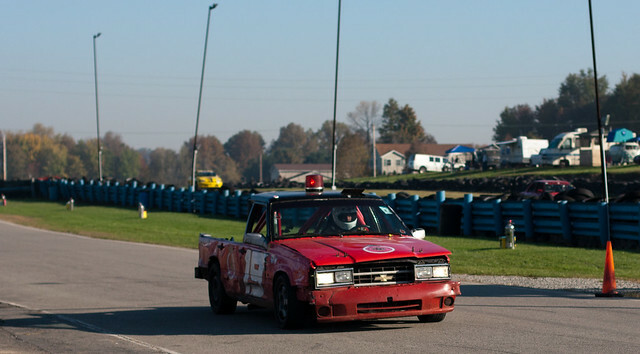 All of our drivers got enough time to learn the course and the car; two guys hadn’t ever been on track and three of them hadn’t even laid eyes on our race wagon truck. For an additional $50, we got to do a night test session from 7:30 to 9pm which was invaluable. We did 3 full driver rotations during this time, practicing pit stop duties and driver changes, in addition to giving all drivers a chance to see what night racing at Nelson Ledges is like. Foggy, as it turns out. Our session ended nearly on time when one of our drivers had an off-track excursion resulting in the newly trunk-mounted battery repositioning itself to the spare tire well. After the night session we headed into Garrettsville for dinner at the local brewpub, which proved to be superb. 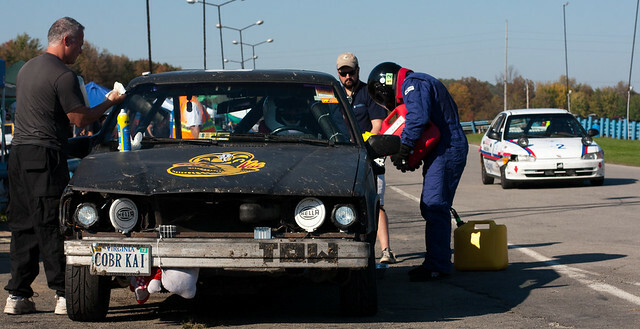 One more trip to Walmart for a better battery hold down solution, filling the gas cans, and we were ready to race. In the morning we installed a battery box to ensure it wouldn’t move again and got rigged up to race. Opening race traffic, combined with tire-cooling caution periods and furious passing on restarts, is not a good place for novice drivers, so Charlie and I were the only options for the first stint and my love of driving in traffic got me the first stint. The first hour on track was a combination of nearly constant local yellows and long full-course cautions punctuated by furious battles for position on green track. Our first contact of the race happened in the middle of my stint—attempting to re-pass a car that had just used power to get by on a straight, I tucked inside. Between his not expecting me and the foreshadowing of future brake issues, I unintentionally PIT maneuvered the Band of Brothers in the penultimate corner. The #23 car rotate across my bumper and we both went more than a bit sideways across the grass inside of the apex. He rounded the final corner and went into the pits; I didn’t think anything had gone wrong so went easy through a few turns and then continued through the rest of my stint. 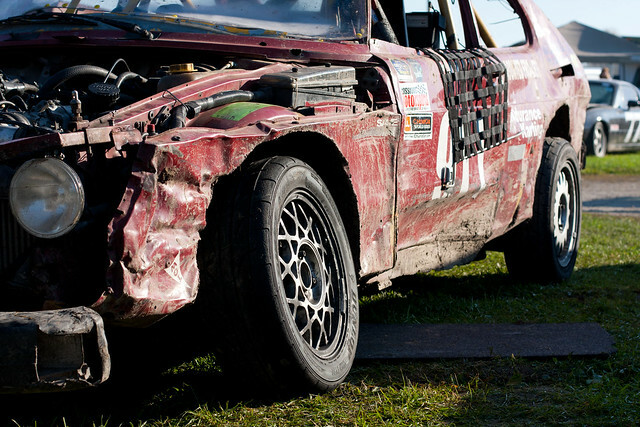 While contact happens in ChumpCar races (and was downright too common in this one), I don’t like having it happen that early. We were both definitely pushing too hard, too early. The rest of our stints prior to the safety break went similarly smoothly, though they were all similarly punctuated by the occasional contact and made tenuous by radio failures. We knew how long the car runs for a tank (1:40 minimum, 2 hours with lots of laps under caution) so such inability to communicate just meant we had a driver hanging out on the pit wall well before the opening of the pit window. At the safety break (only 8 hours in) we rigged up some running lights that the car was missing during the previous night’s practice. Rob asked if we would have time to bleed the brakes because they felt a squishy, but we ended up not having time. Despite the simplicity of rigging tail lights, it ate up most of the break. The headlights were uncovered and we sent out our fifth driver for the dusk stint. We recycled the order at 10PM when I got in for my first night stint—and immediately something felt weird. The brake pedal had gone from having some dead space at the top, to intermittently going to the floor when called upon with urgency. I initially chalked this up to the brakes over cooling, since we were running a full-on race pad compound and the temperature had dropped. I radioed the team and told them to have some duct tape on the wall in case I had to come in and have them cover the brake ducts. A few more laps of toying with that idea by dragging the brakes made it clear something else was awry. It became apparent that the brake pedal often wasn’t inducing full pressure in the system when pressed, resulting in a delay until the ABS pump caught up and built pressure in the system. The master brake cylinder was failing. I radioed the team to tell them we should get a replacement, but the radio was dead. This being an endurance race, I decided to continue on. Giving the brakes a quick half-depression-pump before actually calling upon them to work gave me all the normal braking power and control. I just stayed out of traffic and kept driving until snagging a puncture late in my stint. Since I hadn’t been on the radio the new driver was ready in the pit. I hopped out of the car and gave the other guys the rundown while we refueled and replaced the front tires. The next driver agreed that continuing to orbit and get laps while we got a replacement was the right way to go, so he went back out. 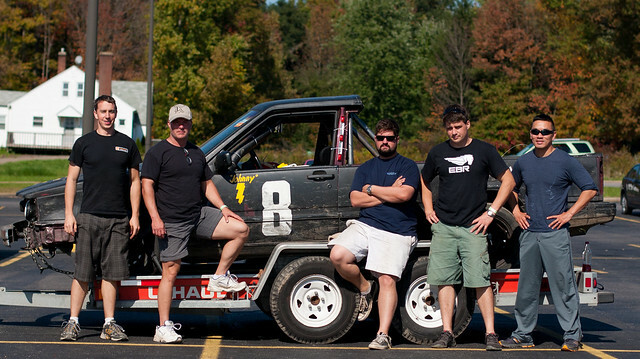 A couple of us headed to AutoZone in Leavittsburg/Warren, which was open until midnight on account of the race. AutoZone didn’t have an exact replacement, it did have hugely knowledgeable (thanks Dan!) that hooked us up with a visually similar part that they had on hand, some brake line, and some compression fittings that would (probably) work. When we got back the other driver was still on track gaining places; we were moving up through the 20s in the standings. As usual, we readied a new driver, fuel, and all of the parts needed to do the replacement. At the end of his stint the report was that the brakes hadn’t gotten any worse and were still driveable. We sent out another driver and continued on the largely functional brakes through the end of the race. Through the night and into the morning we continued to gain a few places each stint and only lose 2-3 during our 10 minute pit stops (about 7 laps at our 1:32 average pace), in part by taking advantage of the very-often caution periods. By sunrise we were steadily making our way into the teens, a phenomenal result from humble beginnings and having our prior race terminated early. We ended up in 13th place out of 74 entrants, ahead of at least two dozen cars that turned faster laps and were still running at the end of the race. By having efficient pit stops and no mechanical failures we took the Volvo faux truck damn near the top of the standings. Designed by jeffwongdesign and forgetfoo. Recognize.